On a recent visit to Colorado our friends took my husband and me up into the mountains. 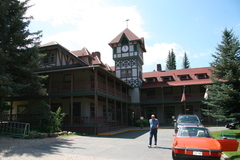 They shared with us a favourite place of theirs, Redstone Inn, Redstone, Colorado, USA. When you come upon the Redstone Inn, you will find a tiny mountain village hidden surprisingly beneath massive red cliffs. There is no way we would have found it on our own. 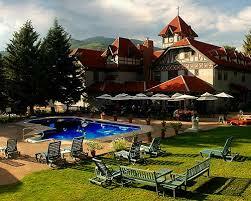 century style resort in the Rocky Mountains about 50 miles from Aspen. The Inn is an early 20th-century Tudor-style property. There are several antique pieces of furniture, lots of interesting artifacts and fine paintings. Our room was on the corner of the ground floor. It had two windows and was really light and bright. The en-suite bathroom had lovely old-fashioned tiles, but it had all the modern facilities including a full bath and shower and everything was spotlessly clean. The bed was a full king size bed and our room also boasted a table and comfortable chairs. There was even a fancy writing desk. 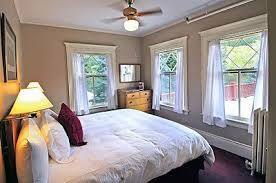 Rooms all have traditional-style decor, free WiFi and TVs with cable channels. We were thoroughly impressed. 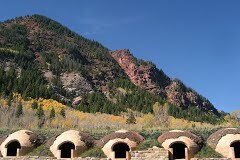 Nearby is the Redstone Park and where you can relax in the sun and watch the Crystal River, or at the end of the road you can examine the old coke ovens. This resort hotel in a wooded valley is also only a 15-minute walk from Redstone Castle. Within minutes of Redstone Inn you can also enjoy a number of breath taking hikes along cascading creeks and into high-alpine meadows exploding with wild flowers and teeming with wildlife. It is a truly lovely setting and we were thrilled to visit. The grill and restaurant is open all day. There is an outdoor pool, a hot tub and gym all available. There is also a business center, but we found there was no cellphone coverage. It was lovely and peaceful. On our first evening we had dinner in the bar and sat watching the humming birds flit to and from the feeder. The meal was delicious, the wait staff were courteous and the setting was idealic. The first morning we left early, so the boys could go fishing. Complementary tea and coffee was available in the bar. They went fishing at the Frying Pan River with Glenn Smith of Taylor Creek Fly Shop, Basalt, Colorado. What a terrific guide Glenn is. They had a great time. On our second morning at the Redstone Inn, we had breakfast. A full choice was on offer and, again we all enjoyed our meals and the surroundings. If you have a chance to visit the Redstone Inn, please take it. You will enjoy it. My husband and I looked to find fault. I decided that the only ones I could find were that there was no room service and the reception was not open 24 hours. In reality neither of these affected us. My husband is a tall man and the only fault he could find was that our shower was set at 6 feet. He really needs the height to be at least 6’6″. That was all we could come up with! This is a wonderful place. I highly recommend it. It really is unique, Norman. We love this spot and were happy to share our Colorado secret with our dear friends! We were just talking about Redstone again last night. We would never have found this treasure on our own! This sounds lovely, Val. I am glad you ad such a good holiday.